The HygroPalm HP23-AW-A offers the perfect solution for on-site water activity measurements to confirm product stability and indicate shelf life. The HP23-AW-A is suitable as a mobile laboratory unit. 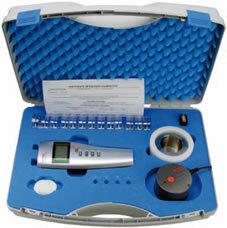 The HP23-AW-A is perfect as a portable analyzer and is supplied ready to use in a kit which includes handset, cables, sample chamber and sample cups and calibration standards. Choose either 14mm or 40 mm deep cups. Both sizes fit the sample holder chamber and can be changed and reordered at any time. The handset can also be used with other sensor probes (not included with this kit) for measuement of relative humidity elsewhere.